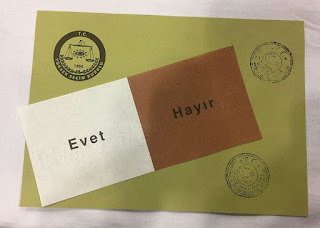 Whilst the sentiments of Turkish citizens voting abroad from embassies in Germany and Austria were solidly in favour of constitutional reforms that would give the country’s executive broader, consolidated powers more in line with those of the president of the United States, there was no clear majority among domestic polling stations. Though the election commissioner is expected to release in ten days, the party of Erdoğan is already claiming victory with a bare fifty-one to forty-eight percent majority in the contested referendum. The opposition party is to launch an investigation over voting irregularities. With campaign pledges certain to derail any hope of Turkey’s pending membership in the European Union, it would seem that the expatriate community would not vote against their own self-interests but with relatives and in some cases whole families left back in Turkey, I suppose these voters are also among those that could be easily intimidated, just enough to nudge the outcome.